This comes from the post Could W. A. Criswell sign A “Statement of Traditional Southern Baptist Understanding of God’s Plan of Salvation?” by Dr. Tom Ascol. This entry was posted in Calvinism, Great Quotes, The Expositor, Thomas Ascol, W.A. 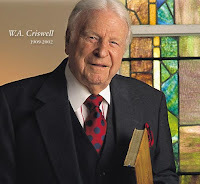 Criswell on 15 June 2012 by Michael Corley. Mike and Scott Reiber continue their discussion on the bible study Questions a Traditional Southern Baptist Wants to Ask a Calvinist, this week looking at the ridiculous claim that reformed theology only appeals to “affluent, white collar” people. This entry was posted in Apologetics, Calvinism, SBC, Scott Reiber on 6 August 2011 by mcp. In the classic MCP, Mike shares portions of a sermon by Pastor Jeff Noblit as he explains why he is encouraged by the rise in Calvinism or Reformed Theology in Southern Baptist churches. This entry was posted in Calvinism, Jeff Noblit, SBC on 23 July 2011 by mcp. Mike and Scott Reiber continue in their discussion on critical questions one pastor’s bible study curriculum posed concerning Calvinism and Reformed Theology. In part 2, they examine the sovereignty of God, the will of man and does God cause all things to happen? This entry was posted in Apologetics, Calvinism, Reformed Theology, SBC, Scott Reiber on 16 July 2011 by mcp. Mike and Scott Reiber begin a series of discussions concerning 17 questions that are one pastor’s study in which the goal is to debunk Calvinsim. On this program they begin by addressing the subjects of election and original sin. Stay tuned…you DONT want to miss these programs! Mike also recommends you download a past program featuring a sermon by Pastor Jeff Noblit titled Encouraged by the Rise of Calvinism in the Southern Baptist Convention. This entry was posted in Apologetics, Calvinism, SBC, Scott Reiber on 9 July 2011 by mcp. Click on the image to get your copy of the book. See more about the book. This entry was posted in Calvinism, PCA, The Expositor on 24 February 2011 by theexpositor. This entry was posted in American Christianity, Apprising Ministries, Calvinism, John MacArthur, The Expositor on 14 February 2011 by theexpositor.